Administrators can now specify globally if links to attachments within shared vitae should be enabled or disabled. This is applicable to all sections within a vita. However, administrators can change the link behavior for individual sections. This overrides the global vitae settings for link behavior. In the Configuration section, click Vitae. Select a vita to edit, or create a new vita. In the Display Link to Attachments list, select the desired link behavior. This is applicable to all sections. To change the link behavior for a specific section, click the Edit icon for the section to be changed, then select the desired link behavior in the Display Link to Attachments list. When filling out an evaluation form, a warning message now displays if the Cancel button is clicked. This helps prevent an accidental cancellation of an evaluation form and data from being deleted. 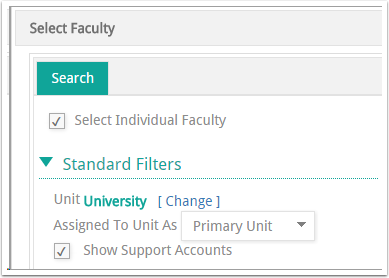 Faculty now have the option of displaying support accounts in the faculty picker when adding a coauthor. This is available in the Activity Input Form Scholarly Contributions & Creative Productions and Grants sections. This feature is also available for proxy users through the Access Settings feature (Access Settings must be activated for your institution by DATA180). Click Scholarly Contributions & Creative Productions or Grants. Select an activity to edit, or add a new activity. In the Coauthor section, click Add. The Select Faculty dialog box opens. Select or clear the Show Support Accounts check box. Currently, when a coauthor is added to an activity, the coauthor is automatically notified through an e-mail message and has the ability to approve/disapprove the action. Institutions can now request to have the notification functionality disabled. Please contact DATA180 for more information. When using the Search Faculty feature on the Dashboard, the search results no longer allow users to view a vita. Instead, contact information for each individual displayed in the search results is now available. This is to help protect the privacy of faculty members. Institutions can now request to have the Creator field in evaluation screens removed or re-labeled. Please contact DATA180 for more information. A new article has been added to the knowledge base regarding importing and exporting CCV data with FACULTY180. See more information.